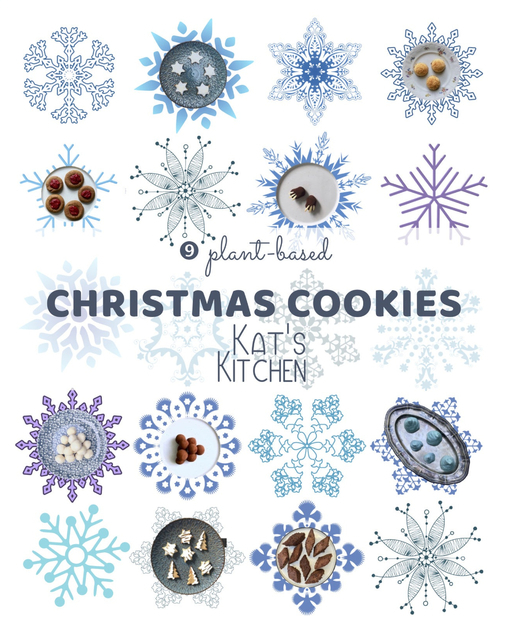 This cookbook contains nine exciting plant-based Christmas cookie recipes. The most delightful treats to celebrate the festive season. Hold on - these are not any ordinary cookies, Kat's Kitchen delivers a surprisingly new twist on old favourites. These recipes are not only egg-free but also dairy, industrial sugar, oil, and flour-free. Kat's recipes prove that this is not only possible, but also that these recipes can be extremely tasty! Get your hands on coconut snowballs, cinnamon stars, aquafaba and spirulina Christmas trees and of course, on the cut-out cookies. Most ingredients are suitable for specific dietary requirements or food allergies. Plant-based Christmas baking has never been so delicious, easy and diverse. What more could you ask for? Most recipes can easily be prepared in your food processor, blender, coffee grinder or kitchen machine. The recipes were created with love and passion, written in detail and display a beautiful photograph to show you how they should look. In total it presents nine carefully tested, irresistible cookies. All cookies are made with the best superfoods available and nourishing ingredients. This plant-based treasure book is a must-have for fans and food-lovers alike. It's also perfect for anyone looking to experiment with plant-based baking for the first time. Troubleshooting hacks will give you handy kitchen tips. Plus, on top of this Kat's homepage even provides online video tutorials for every single recipe! Too good to be true? Come and see for yourself! Kat's Kitchen will make your taste buds come alive! Egg-free, Dairy-Free, Industrial-Sugar-Free, Oil-Free, Flour-Free Recipes! Delicious and Nutritious.